St. Barths is like an old friend that, even though you don’t see one another often, once you’re back together, it’s like you’ve never been apart. The plane touches down on the small runway, a rush of excitement hits and I think, “I’m back”. I look enviously at the sunbathers and swimmers on St. Jean beach. Gone are the previous events of the day – the 3:00 am wake up call, standing in security lines amazed that people still have to give up their water and $4.50 Starbuck coffees, waiting with mild angst for our small plane to make the final 10 minutes of the trip. I’m back to one of my favorites places on earth. The annual owner’s party was a determining factor for traveling in August. This year’s soiree was held at Le Sereno and there was a turnout of over 300 people. In the typical Sibarth/Wimco style of hospitality, the party was not limited to owners. Clients, friends, family, and guests of owners, local island associates, all were welcomed. It was a beautiful evening with plenty of champagne, food, and good company! I am always impressed at how the Sibarth staff is excited to be there representing the company, and I was thrilled to be there representing Wimco. It has often been said that St. Barths is like no other island. The secret is out because the island was very busy, as were the villas and hotels. Many of the properties we visited were occupied by either clients or owners. It was a rare treat to have the house open and unoccupied so you could take your time and not worry about interrupting someone’s vacation. Our collection of properties is varied to say the least. There is the simple, inviting one bedroom,Villa SIB PSL, which begs you to make a cold drink, kick off your shoes, get back into that best seller, and dream about living here forever. 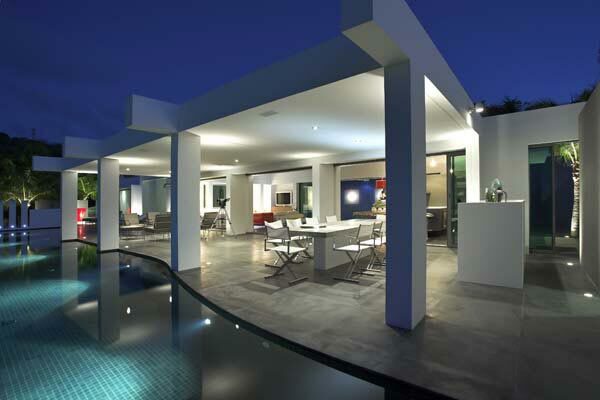 Or, by contrast, there is the very modern, tastefully done Villa SIB NIR, a beautiful villa that makes you think, “this house is so cool, let’s have a party so we can share the experience with all of our friends.' 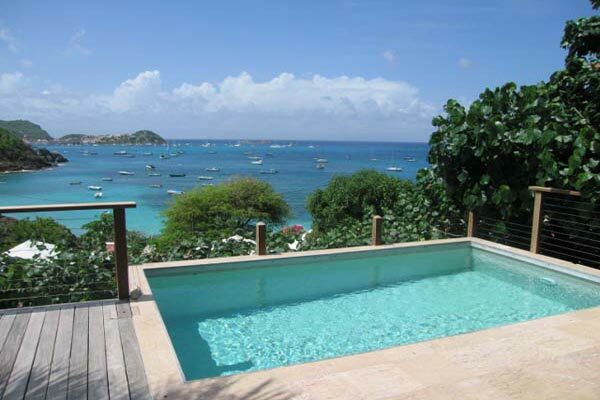 Also, stay tuned for the new, soon-to-be-on-our-list, two bedroom apartment in Gustavia, which will be called SIB ROS. 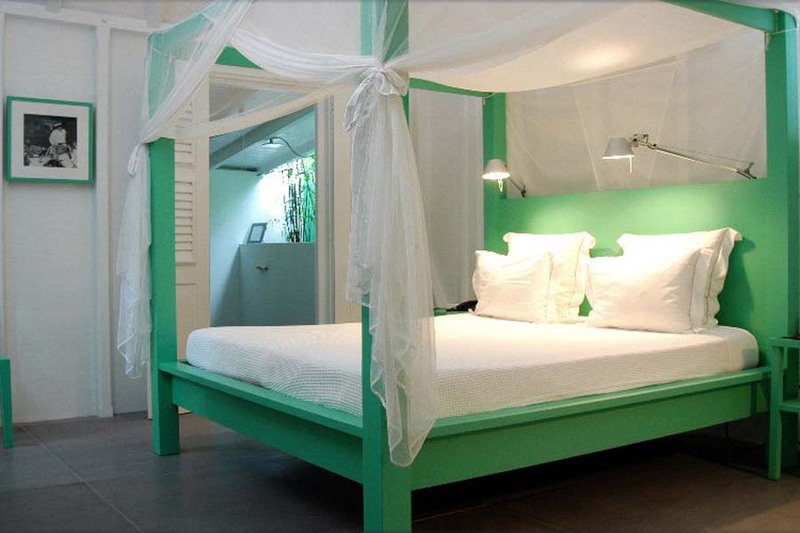 This is the pied a terre that people dream about, with the beautiful views of Gustavia harbor, a private pool, and walking distance to the harbor, shops, restaurants, and rotissiere. One can easily start to imagine themselves walking back from the patisserie with plenty of goodies, complete with the obligatory baguette hanging out of the market bag. We met with the charming new owners of the hotel La Banane, and they had rooms to show us, due to checkouts that morning. I thought that going to La Banane was a treat! The new owners are anxious to work with us and I liked seeing new, young energy going into the hotel. They are refurbishing the lobby and reception this fall and really seem to “think outside the box”. I think the island takes on many different personalities each day. In the morning, there is a certain serenity complimented by warm ocean breezes softly rustling the palms trees and long grass. Driving to the bakery before going to the office would lead you to believe that the island must be slow, with few visitors. A quick stop for café au lait and a “jambon et fromage” begs the question, “how do the French do it?” A steaming cup of coffee on a hot August morning tasted like nirvana, and a little puff pastry that is not your mother’s ham and cheese! The day starts to get busy, the shops open up, motor bikes and small dump trucks erase the peace and quiet, and the island suddenly comes alive. At lunch time, the restaurants fill up with people who’ve been at the beach all morning, business owners, friends meeting friends, and plenty of children who are simply “along for the ride”. Sunday lunch at Sereno is a treat, and I think one of the best beachside restaurants. Aside from the crisp service, appealing menu, and delicious food, there’s always entertainment from the families where half of the diners are at the table, and the other half are with barefooted little ones on the beach. Evenings on the island suggests cocktail hour and another ritual - dinner. People watching in the restaurants is a great part of the evening, trying to figure out where the people are from, “are they American or European?”, “where do you think they are staying?”, “I think that’s one of our clients!”, “is that his wife or his daughter?” Dining on the island is a special treat and a large part of what makes St. Barths special, still asking the question “how do they do it?” A simple grilled fish, a chilled glass of rose and you just know it would never taste the same back home. While there is nothing really new to report on, I can tell you that this destination we work so hard on to provide flawless, memorable trips to, is still as wonderful as always. I did try Jet Blue for the first time, traveling from Portland to JFK, then JFK to St. Martin. I cannot say enough about how wonderful this airline is. They have a loyal customer in me and I will not fly with anyone else, given the option. The reason I have become so loyal to them (I have used them before for other destinations), is that one simple, simple thing: their customer service. It’s truly amazing the power of those two words, don’t you think? Back in the states now, my coffee au lait is replaced by a single K cup from Keurig, the lovely puff pastry with the jambon et fromage is now a yogurt, and the warm ocean breezes are a raw, wet wind, remnants of tropical storm Bill. Regardless, it’s good to be home, as I know that my long time friend, the tropical paradise called St. Barths, will be there waiting for my return, welcoming me as though I’d never left.